We had another hard day, but with another happy ending—this time, we’re proud to say that we toughed it out and pedaled to the end. On our way out of our beach we stopped by a grocery store to buy water and ask directions. The proprietor sent for her 12-year-old daughter, who explained that the road we were on lead to a dead end in the mountains, and we had to backtrack nearly 15 km to take the right road. We were confused at the directions, because the only turnoff we’d seen on the way in was a narrow, bumpy road leading straight up into the mountains, and according to our map we were safely in Albania’s flatlands. Not true. The bumpy mountain road was indeed the one we needed, as confirmed by two police officers, four roadside bar patrons, and the original 12-year-old girl from Drac. With no other viable choice, we spiked our water with Powerade powder and started climbing. After four hours we made it to the peak, where I climbed a roof that afforded one of my favorite views from the whole trip, overlooking the vast plains of north-central Albania with rugged mountains in the background. We quickly descended, but again faced Albania’s challenging infrastructure in the form of a 10-km dirt road more fit for hoofed than wheeled transport. Finally, after dropping my panniers several times and most likely a filling or two, we reached the highway that led north to Shkoder. At this point we had lost all hopes of reaching Shkoder today, but the speed with which we negotiated the smooth asphalt of the flatlands gave us strength, and we decided to go for it after all. After another four hours, we saw Rozafa Castle rising in the distance, and we knew were were home. We’ll relax here for the night, charge our batteries (literally and figuratively) and tomorrow we’ll embark on the last leg of our journey, to Podgorica via Shkoder Lake. Terrain: These 90+ km were more challenging than we had anticipated. First we had to backtrack quite a bit from San Pietro Beach (Plazhi San Pietro) to Shkafane to catch the road we wanted to take toward Shkoder. Between Shkafane and Ishem (that little white space on the map below) is all mountains, which caught us by surprise and added a good chunk of commuting time. The roads are good, but mountain after mountain tires you out no matter what; the beautiful scenery kept us going. We passed through many dirt and gravel roads as we approached Bushnesh. 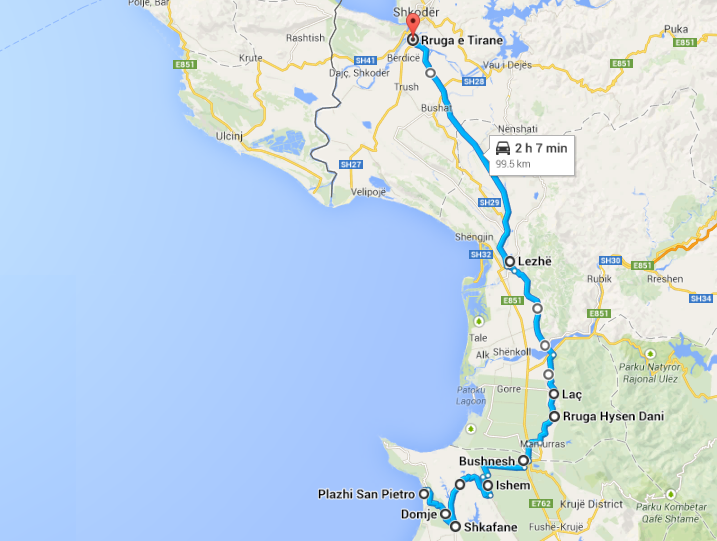 Once you hit Lac, there are several options to get to Shkoder. We opted to take paved side roads that passed through villages and afforded nice opportunities to meet with locals and quench our thirst when needed.